As I sat sipping a nice, hot cup of Earl Grey at my favorite pastry shop, I was approached by a curious gentleman that explained to me that I was to accompany him on a fantastic journey. Being that I had never seen this man in my life, I understandably scoffed at his request and turned back to my cup. He then exclaimed that he needed my help to complete a journey around the world in only 80 days. Being the adventurous type, and quite needing a vacation at that moment, I agreed and off we went. Well, that isn’t quite how the game begins but after playing Inkle’s new game, 80 Days, I feel like an adventurer in a re-imagined Victorian era of amazing steampunk inspired traveling machines in an ever changing, intricate world. 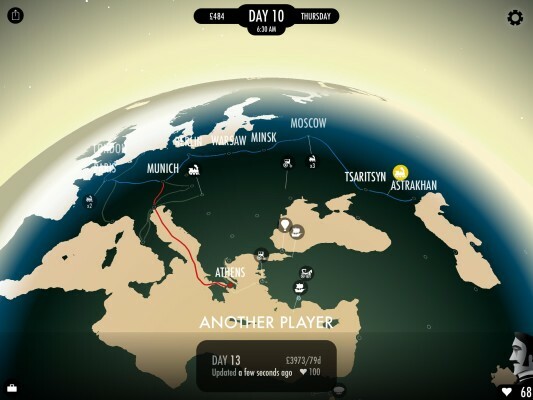 80 Days is an adventure set in the year 1872 that takes you on a race around the world in real-time. 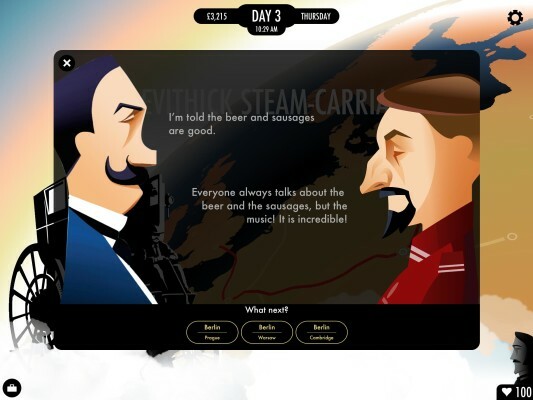 Inkle has penned a humongous script of around 500,000 words and created an experience that will present to you more than 10,000 choices to make. With an offering like that, everyone bold enough to take on this journey is guaranteed to experience their own unique story on their path to becoming the first to circumnavigate the globe in 80 Days. It’s important to purchase items in one region to resell in another but you have to be mindful of the amount of luggage that you bring along or it will cost you more for you to travel with all of it. 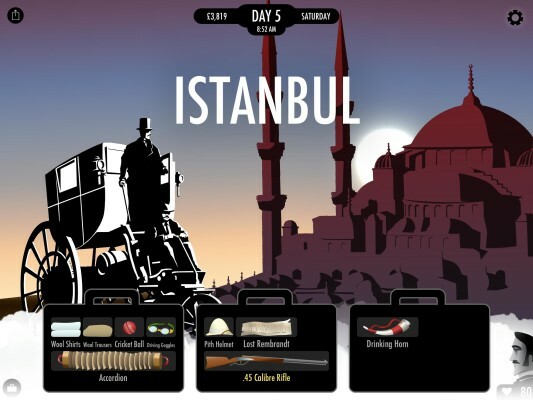 80 Days is a unique take on the choose-your-own-adventure type of storytelling and presents the player with several specific story directions and then allows them to decide which way to go. This is a game that is comprised of an extremely branching narrative that practically writes itself around the players’ choices at the moment that they make them. The player is faced with a new decision every three to seven sentences. This decision could have to do with which direction to go, which character to talk to for new information as well as the best way to respond to that persons inquiries. All this is important and will impact later options offered to you as the game remembers every choice that you have made up to that point. As your adventure continues on, the options will reflect your previous decisions and the AI will learn your preferences and begin to reflect them in the ongoing narrative. This all combines to create an experience that is unique to that particular play-through. Once you complete a game and start another that newly started play-through will be wholly different than the last. In 80 Days, you take on the role of Frenchmen Passepartout who is accompanying Phileas Fogg in a race that he has wagered he can complete in 80 actual days. Laid out before you are hundreds of journeys that can be taken on thousands of routes. You will have the opportunity to travel by hot-air balloon, camel, horse-back, hover-car, airship, gyro-copter, hydrofoil, steamer or express train. The way you decide to go and how you get there is all up to you. Once you are in a location, you have the option to find lodgings for your stay, plan the next leg of your trip, explore the city to interact with the natives and discover new routes and new modes of transportation, as well as taking the opportunity to visit the markets and purchase items that will make your trip more enjoyable. It takes money to grease the wheels of your travel progress, so to speak, in order to make the trip around the world. It is a good idea to buy items that are specific to that region so that when you travel to another region, you can sell those items for a higher price in order to purchase lodging and passage to continue your journey. From the map screen, you can see other players and where they are on their individual journeys. In addition, you can plan your own route by checking travel prices and available routes. The visuals in 80 Days consists of a map of the globe and black and white representations of the different steampunk inspired forms of transportation. The actual text of the story is overlain onto the screen and scrolls up as you make your decisions on how to proceed in the game. The images of the trains, boats and hot-air balloons, though they are just in black and white, are intricately detailed and stand out against the multicolored globe and journey locations in the background. Routes that you can take are superimposed onto the globe and you can manipulate it with a swipe or a pinch of the fingers. The images of Passepartout, Phileas Fogg and the many interesting people that you will meet and speak to on your journey are nicely designed and colorful and stand out in stark contrast to the other visual elements found in the game. These elements all balance out to create an interesting juxtaposition of gameplay and Victorian steampunk imagery. In order to craft an experience that would be able to adequately hold the attention of the player that has no recorded voice acting, the sounds and music in 80 Days had to stand on their own while helping to create the feeling of traveling on a long and at times very intense journey. The sounds of the whistle on a train and the sound of the wheels as it lumbers down the track is surreal and inviting. The roar of the engines on an airship rumble with weight and intensity. The sounds that can be heard in a local market of people haggling and enjoying their day makes you feel like you are actually there. This aspect of the game had to be perfect in order for the game to keep the player engaged and interested in finding out what the next leg of the journey would bring and I think that Inkle has done a great job of nailing this feature down. You can spark up a conversation with people who are traveling with you or who live in the cities that you visit in order to gain information on new routes and conditions in neighboring cities. 80 Days has been an awesome journey for me and I think that this genre is better because of Inkle’s dedication to providing a different type of video game experience to the masses. Although, as I progressed in the game, I got better and better at determining how to interact with the people in a particular city in order to find new routes to take to the next city, there was a bit of a learning curve to figure out how everything worked. This was the first game from Inkle that I have played so I wasn’t familiar with the mechanics of the game and was unable to find a user manual or any information on why I was presented with certain options and what the best way to interact with the interface was. 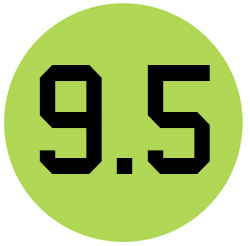 Through trial and error, I was able to figure out how to best use the information that I was confronted with and how to use the interface to make things happen, but I would have done better time- and resource-wise had I had some information on how to proceed in the game. The addition of a Tutorial, where the user could choose to go through it or not, would have been a way to introduce new players to the game mechanics. In addition to giving players the ability to choose their own paths through 150 cities, the best way to get there and which subplots to follow, 80 Days also provides a cool live feed feature that shows the progress of all other current players in real time. This gives the player the ability to see what path others are taking, maybe think of some ideas for their own journey and compete to see who can post the best times racing around the globe. When I first looked at the map of the globe, I saw the icons for the other players and I wasn’t quite sure what they were there for. Upon further inspection, by simply taping on those icons, I figured out that it was other actual players taking the journey at the exact same time as I was. That changed my thinking about 80 Days in that it provided more incentive (in the form of a streak of competitive compulsion) to continue my own journey and to try and beat the other players to the finish line. Other than the small issue of the lack of a Tutorial, I found my time in 80 Days to be very enjoyable and definitely worth an additional play-through or five.